As a busy wife and mom, I’m a pretty big fan of multi-use products and that makes liquid castile soap a staple in my house. I started using it many years ago. First, I tried it as body wash and liked it. Then I used it for my kids skin and hair, and was more won over. Eventually I learned to use it for household cleaning and was completely sold. Since then, I just keep finding more and more uses for this versatile soap. Castile soap originated in Castile region of Spain (hence the name), where olive oil is produced. Some castile soap is made purely with olive oil, although most are a blend of different oils including coconut oil, palm kernel oil, hemp oil, jojoba oil, etc. It is more concentrated than most types of soap or liquid cleanser, which is why just a small amount does the job. 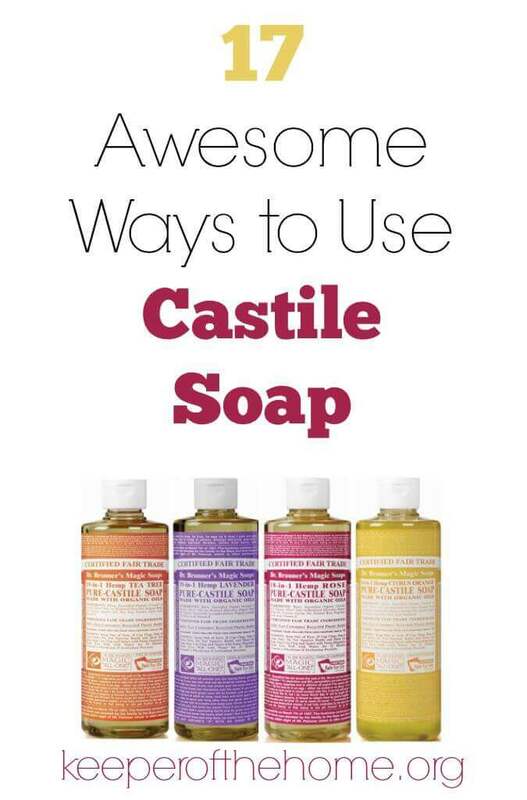 If you haven’t yet tried castile soap, you really must. This stuff rocks my crunchy little world. Seriously. I came up with 16 ways that you can (and I do) use it around the house, on your body, and even for traveling. 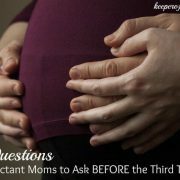 I love to use the baby mild/unscented or almond scent for this in particular – just a couple drops poured into my palm and lathered up with water does the trick. If you want to get a little fancier, you could mix it up into my Homemade Foaming Facial Cleanser. Liquid castile lathers up really well on a cloth or shower pouf or just with your hands. I love peppermint castile as it has this fresh, tingly feeling that is super refreshing. This is my go-to for shaving instead of buying a shaving cream. It lathers up, makes my razor glide nicely and doesn’t leave my skin irritated or dry. Again, just a few drops rubbed onto your legs or armpits in the shower and you’re good to go. I put a few drops in the bath (note that it won’t foam up very much when used this way – it’s not like bubble bath). 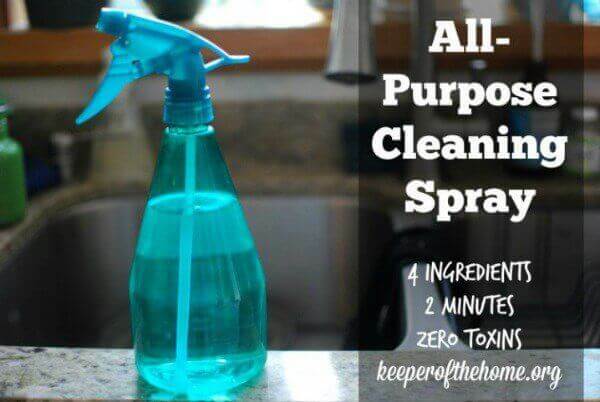 I just add it into the water for bit of extra cleaning power on dirty kiddos, and I also use it directly on a wash cloth to scrub them in place of bar soap. When they’re young, they don’t really need shampoo at all. Plain old water and just a drop or two will do. As their hair gets longer you might need slightly more to be able work it completely through. It’s not until they get older (like pre-teen age) and start to get oilier hair that you actually need to switch over to some sort of actual shampoo. I try to avoid the peppermint one for this purpose, since it can sting a bit more if it gets in eyes (the baby mild/unscented version is perfect). 6. To clean your bathroom super easily. 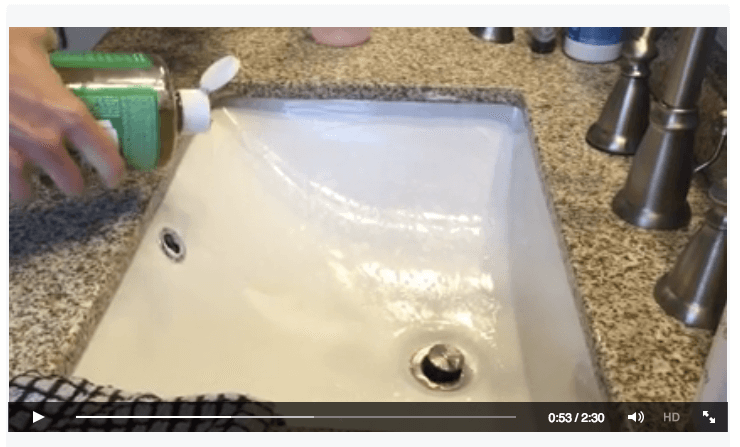 This 2-minute video on Facebook shows you my quick and easy, 3-ingredient bathroom cleaning method (and for those curious, I’m 8 months pregnant in the video – except now that cutie pie is almost 2 months old!). The only thing to note is that I made this video very shortly after we renovated our bathroom and had new granite countertops. I didn’t know at the time that vinegar isn’t good for granite (now I know! ), and so I’ve since switched over to wiping them clean with water and a few drops of (yup, you guess it) castile soap. Even if you don’t want to give up your usual bathroom products, castile soap is perfect for those quick toilet scrubs in between cleaning sessions. If ours needs a touch-up, I just reach into the shower for our castile soap bottle, put a few drops in the toilet and scrub away. 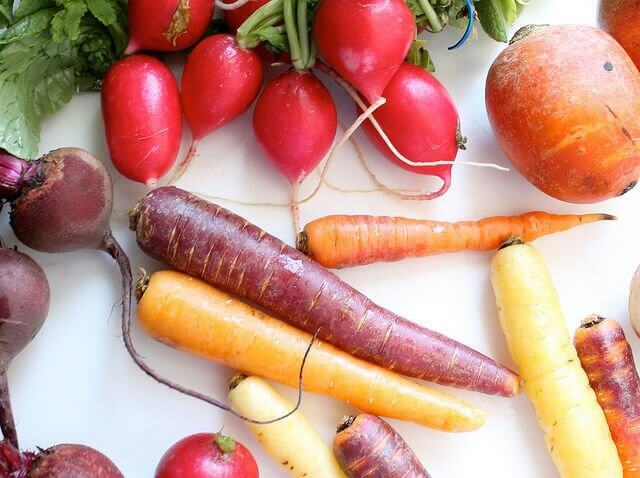 Add a few drops (or about 1/4 tsp if you want to measure) of liquid castile into a bowlful or half-full sink of water, and let veggies soak for a few minutes, then scrub/rinse them off. About 1 Tbsp of soap in one gallon of hot water will get your floors nice and shiny. I’ve seen recipes that call for more but honestly, I usually use even less (more like a tsp or two) and it gets the floor squeaky clean. I first tried this using this soft scrub recipe, and substituted castile soap for the liquid soap it called for. It made the perfect substitute and now I never make it any other way. I use this for scrubbing sinks, tubs, faucets and much more. 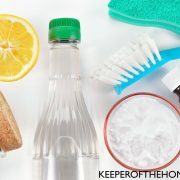 This DIY All Purpose Cleaning Spray whips up in 2 minutes, contains 4 ingredients (castile soap plus baking soda, tee tree oil and water), and is completely natural and toxin free. 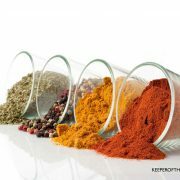 You can use it all over your house — kitchen counters or stovetop, all over the bathroom, laundry room, you name it. If you do have a Bella or Ryker or Princess that gets all dirty and stinky, I hear castile soap works like a charm in a doggy bath. So have fun with that. 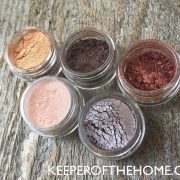 Heather, in her post at Mommypotamus, says that “Like diatomaceous earth, soap also dissolves the waxy coating on the outside of the ant. 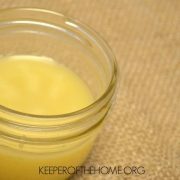 Make a castile soap spray and use for several days in a row, spraying liberally where you’ve seen ants or wherever there are cracks or entry points for them.” Easy enough, right? This is sooo much cheaper than buying hand soap from the store and works just as well. I’ve bought a couple bottles of natural foaming hand soap brands over the years, and then saved my bottles and refilled them myself. Works like a charm. 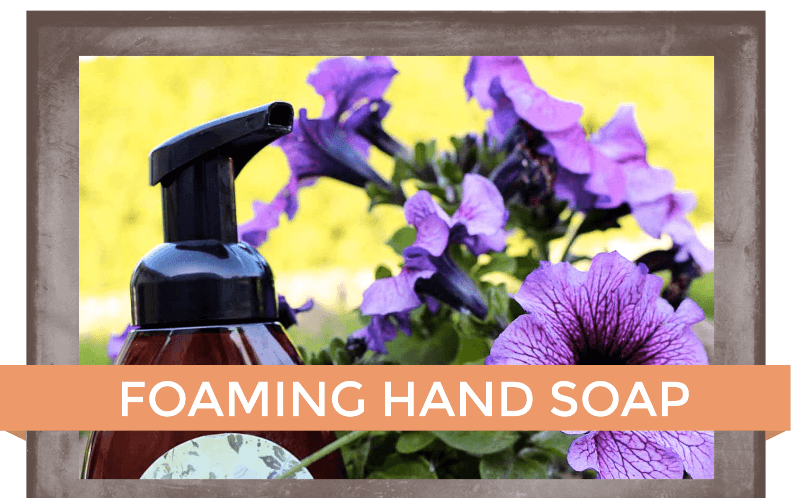 Try this recipe for Foaming Hand Soap in our free eBook Clean & Simple OR just make it plain and simple by filling up your bottle with 1 part liquid castile soap to 3 parts water. If you buy your castile soap already scented, all the better. All right, I have technically never done anything fancier than cleaning off my garden tools with my hose. Ahem. But Andrea, smarty pants that she is, actually cleans her tools and garden pots and says castile soap will help you do the job. So there you go. I don’t do this on a regular basis, but when you’re traveling (which we do a lot of) or camping or just staying in a hotel and need to wash up a small amount of dirty clothes, this does the trick. We use these travel toiletry containers (pictured above) and I always bring along one with castile soap wherever we go. It doesn’t work as well as regular laundry detergent, but it will get things clean enough. Again, I don’t find this as effective as actual dish soap. But, for camping or in a travel situation where I can’t easy get dish soap, this is what I use instead. It foams less, but you’ll still get your dishes clean. I’d love to know your favorite uses! I just wanted to tell you how much I appreciate your site. Anyone I have shared it with has also fallen in love with it. Ryan is quite the salesman also! I only wish I could actually sit and read all the wonderful books in the bundles I have bought. I love all of your ideas! I also appreciate that you are Canadian and mention brands that can be purchased here in Canada. God bless and thank you for sharing! Thanks for all the ideas on how to use Castile soap! 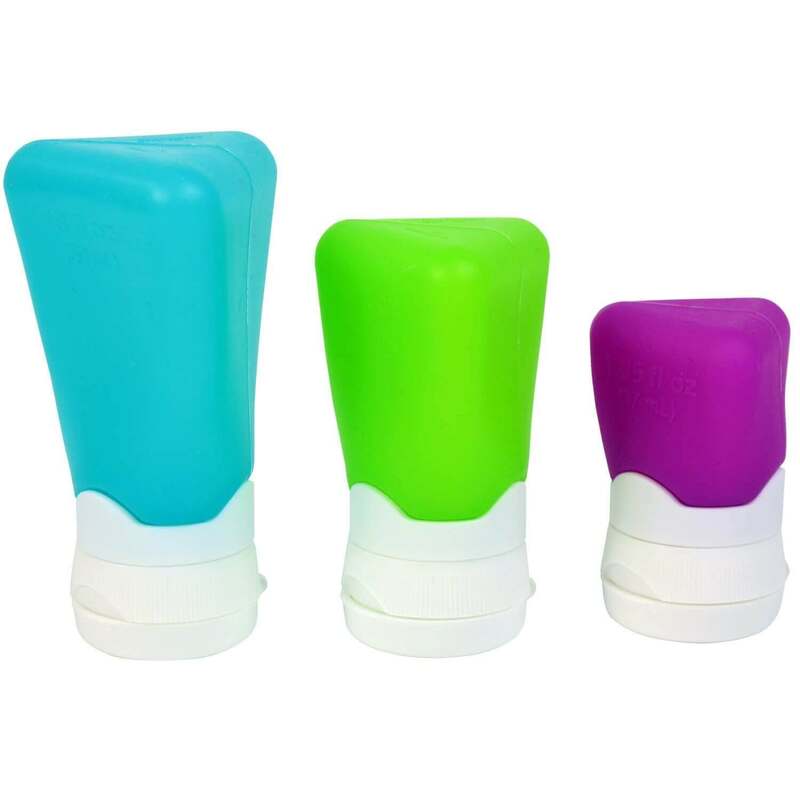 I’ve been using it for quite a few things including hand soap and to wash my kiddos. Another use that I love is to make a baby wipe solution. We use flannel wipes for our 8 month old’s diaper changes. I use a tbsp of Castile soap, a tbsp of coconut oil, and a tsp of vitamin e oil with a cup of distilled water. I often add a drop of lavender and a drop of tee tree essential oils as well. 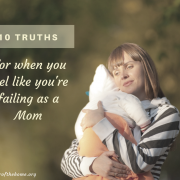 I keep it in a squirt bottle on the changing table. Also works for quick wipe downs between baths for sticky hands, necks, and faces! I love Castile Soap. I have use it in all my cleaning products. It is awesome! I buy the plain as then I can all whatever EOs that I want for whatever use. Marie, I have bought Castile soap at a chain natural/organic grocery store in my town. And it is also available at amazon.com. PS, I have no affiliation with amazon, just providing information. Marie, I am in California and I find Castile Soap in the organic soap section of my local CVS drugstore…. You can make liquid soap from the bar! 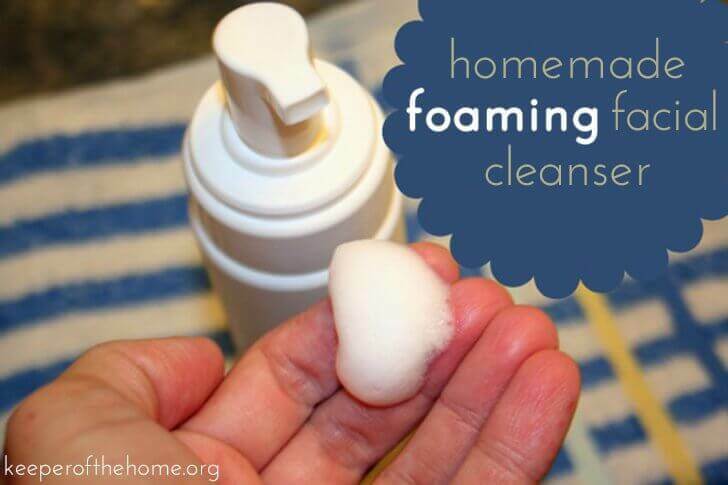 I do it all the time for foaming hand soap! A little late to the game here, but I found it at Target. Regular & Lavender. My husband and I spent 6 weeks traveling through Germany a few years ago, with just what we could fit into our backpacks. Since we didn’t want to carry a lot of stuff around from city to city, we only had 2-3 changes of clothes. Almost every night we hand washed our dirty laundry in the hostel/B&B/guesthouse shower with castile soap, then hung it to dry near the heater. It was really convenient to have that one little bottle to clean our clothes, dishes (the few we had), and bodies! It has been our go-to body wash and hand soap ever since then. Love castile soap! Thank you for this post! Do you have any other sources for Castile soap that you like, other than Dr Bronner? HI Stephanie! Dr Bronner’s peppermint castile soap makes an excellent natural toothpaste! It’s all we use, even my 3 and 5 yr-Olds love it!! I am new to castille usage, and plan to try it in bathing and laundry, and more, if I like it. My question is this. – I currently have an almost full litre of standard liquid soap refill, which I am loathe to waste. Can I dilute one with the other, plus water?